EMS is a mobile phone craft project by Kate Pemberton and Jacob Masters. Designs have been created that can be accessed using your mobile phone, and as patterns to cross stitch. EMS messages can be recieved as image wallpapers for most mobile phones, there are 4 designs to collect. 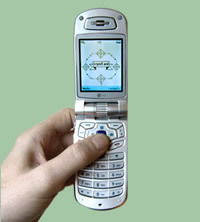 Go to the "send EMS" page to send EMS messages to your mobile, or to your friends. EMS designs are also available as cross stitch patterns, together with full instructions of how to turn the designs into your own cross stitch embroidery. Packs are availble on the "buy EMS kit" page with all you need to make your own EMS embroidery including: material, instructions, thread, needles.. The design of the EMS message/pattern is based on a hybrid of traditional simple cross stitch patterns and modern pixel design. 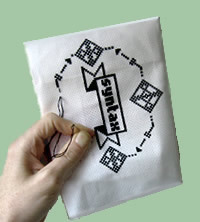 The designs are viewable only as mobile phone images and as cross stitch embroiderys; they can be kept on your phone in your pocket; transported, exchanged, collected, and they can be stitched using traditional craft techniques. Participants are encoranged to learn how to cross stitch and to take part in the project by uploading images of their embroideries. You can view images that have been uploaded so far on the "your EMS" page.